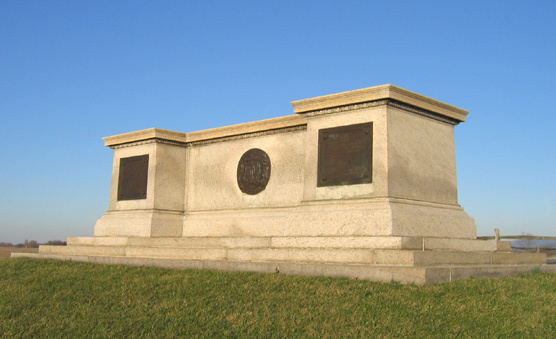 Lt. Col. Wilder Dwight (1833-1862), commanding the 2nd Massachusetts, fell mortally wounded on the spot where the Massachusetts monument at Antietam is now located. And then there was the advance of the 2nd Massachusetts through the Cornfield. The unit had suffered roughly 35% casualties just over a month prior at the Battle of Cedar Mountain. They were led by Lt. Col. Wilder Dwight, a 29 year-old lawyer from Brookline–charismatic, much admired by his men–he seemed to have potential and Massachusetts newspapers paid attention to his actions. Pressing forward to within sight of the Dunker Church, the 2nd Massachusetts soon found that the units on either side of them had fallen back. They were isolated with a solid force of Confederates in their front behind stone walls and fences. This advance is depicted at the beginning of the film “Glory.” In this position, a quarter of the unit fell, including Lt. Col. Dwight who was mortally wounded. Soldiers tried to remove him from the field but he refused due to the pain. As the 2nd Massachusetts retreated, Dwight took out a letter he had been writing earlier that morning to his mother. At the foot, he added, “I am wounded so as to be helpless. Good by, if so it must be. I think I die in victory. God defend our country. I trust in God, and love you all to the last. Our troops have left the part of the field where I lay.” Dwight died two days later in a field hospital.